The answer from me is, OF COURSE, f&ck yes. They can’t search your home, car and anywhere else in the country, they would need a warrant to search devices too. A case by the EFF (Electronic Frontier Foundation) is heading to the Fifth Circuit Court of Appeals in the US to find out what should actually be happening. It’s a touchy subject for most people as with social media accounts, e-mail archives and back-up/cloud services your whole life can be sucked down by a forensic tool using API calls with 1 single access. 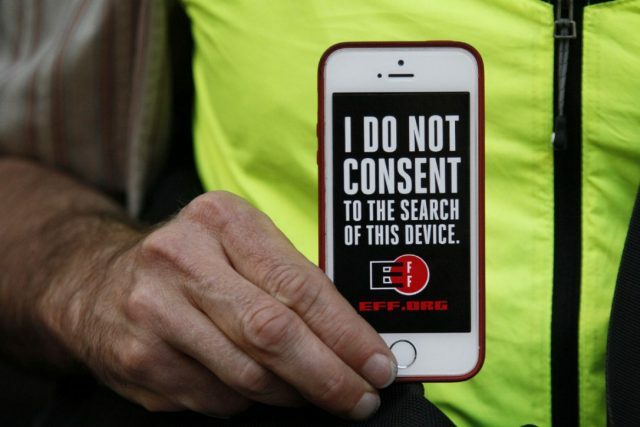 In a legal filing this week, the Electronic Frontier Foundation (EFF) argues that customs officers should be required to get warrants before searching people’s mobile phones (and iPads, laptops etc) in the same way they are typically required to do in the rest of the country. I’m glad the EFF is taking this to the highest echelons of the US court system to make sure people and their privacy is treated well, the laws are fairly well defined but because of the lack of oversight officers pretty much have autonomy to define someone who is ‘suspect’ and needs to have all their devices examined. There’s some weird nuances too like the fact that they legally can’t make someone rat themselves out, which means a password in your head is off limits. But a fingerprint, which is classified as physical evidence is fair game, so they can make you put your fingerprint on a fingerprint scanner, but they can’t force you to type your long passphrase in. The US government – which brought the case against Molina-Isidoro – is almost certain to aggressively defend its right to look at people’s possessions at the border, leaving the Fifth Circuit in a difficult position to try to answer yet another complicated legal issue deriving from our love of extremely powerful smartphones. Hopefully the US courts do clarify it better, add more oversight to the process of seize and search when it comes to border control and make sure everyone is being treated fairly. It’s a fairly complex issue, especially with the US wanting to be so proactive about national and border security in particular, it seems like 1984 is coming true. Must be hard to travel as Richard Stallman in 2017.